The American Academy of Restorative Dentistry (AARD) is composed of the leading teachers, researchers, and practitioners from around the world in the discipline of Restorative Dentistry. 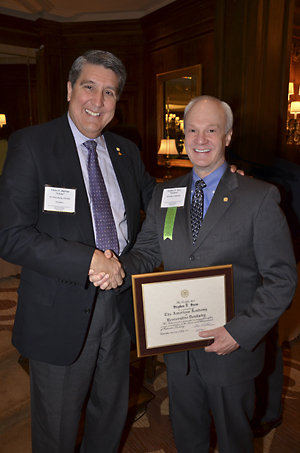 Its members are dedicated to foster the ethical and scientific practice of restorative dentistry. Membership is limited to 165 active members and is by invitation only. 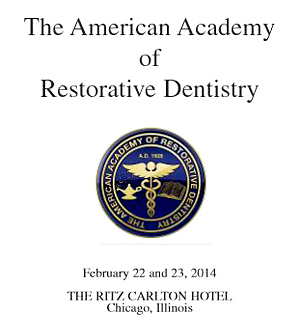 Each February, the Academy conducts an annual two-day conference in Chicago, Illinois. The meetings are devoted to the exchange of clinical and academic information through lectures, clinics, and the camaraderie of the members from around the world. In 2013, Dr. Snow was invited to join the Academy, and last weekend, at the 2014 conference, he was inducted as an active member at the Ritz Carlton Hotel in Chicago, IL. He was deeply honored to share the moment with several esteemed colleagues and mentors (pictured here at the presentation ceremony with 2013-2014 Academy President, Dr. Glenn DuPont). One highlight of the lectures at this year's meeting was the presentation of information about how snoring (as well as sleep apnea and airway obstruction) can influence nightime tooth grinding, premature tooth wear, and even tooth malalignment. High-tech diagnostics and state-of-the-art treatment options are available at Snow Dental Care. In 2007, Dr. Snow was invited to write the first feature article for the first printed issue of "Dear Doctor". (More details of that news here.) This journal was created specifically for dental patients by providing informative articles that answer the common questions most patients have regarding dental diagnosis and treatment strategies. Since then, the complete collection of "Dear Doctor" periodicals has grown to become an invaluable and comprehensive reference. 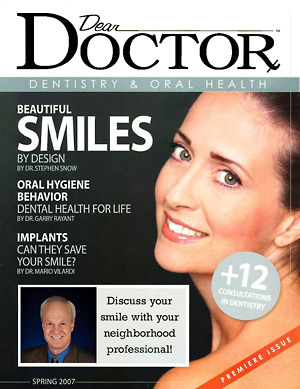 In 2012, the American Academy of Cosmetic Dentistry decided to provide key articles of the “Dear Doctor” library to all its members for electronic publication as an official patient education resource on their individual websites. Dr. Snow’s original article was selected to be included in this special online series. In 2013, the content was republished in printed format. (The journal cover is pictured at right.) The article was also distributed in its web-based format as well. As a result, dentists all over the world are currently using that article to help their patients understand the principles of smile design. You have access to the entire online portfolio of “Dear Doctor” consultations in the Patient Library (under the Helpful Resources tab) here on our website. 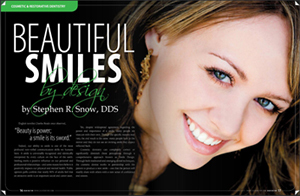 If you would like to read Dr. Snow’s smile design article for yourself, follow this link to "Beautiful Smiles by Design"--the first listing in collection. To learn more about smile design techniques developed by Dr. Snow and how you could benefit from coordinated esthetic treatment, visit our blog. If you would like to see smile design results achieved on actual patients at Snow Dental Care, be sure to check out the beautiful smiles in our Smile Showcase. Stephen R. Snow, D.D.S. 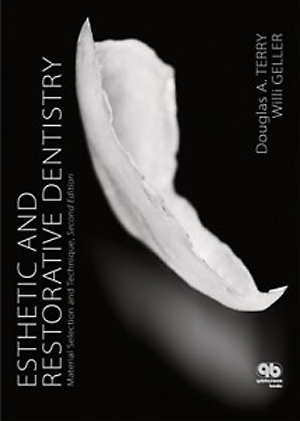 has written a chapter on clinical digital dental photography for a professional reference guide entitled Aesthetic & Restorative Dentistry: Material Selection and Technique. The chapter provides comprehensive instruction about camera selection, setup strategies, and image alignment to help dentists world-wide improve their accuracy in diagnosis, treatment planning, and color matching. The 771-page textbook illustrates the advanced procedures and techniques that are used in everyday clinical dental situations. Compiled by editor Douglas A. Terry, DDS, it is widely regarded as one of the most meticulous and thorough dental texts of its kind ever published. 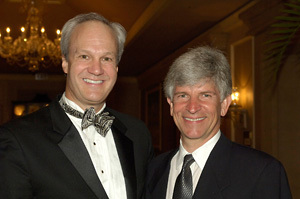 Dr. Terry—a world-renowned clinician, author, and educator in his own right—personally selected Dr. Snow as one of the international panel of experts he assembled to create this indispensable reference. 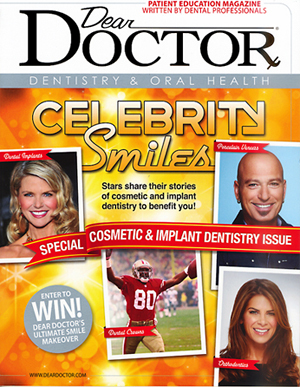 Dr. Stephen Snow has been selected to write the feature article for the inaugural issue of "Dear Doctor", a dental and oral health periodical for patients. Each issue will contain a collection articles that resemble private consultations designed to answer common questions on a broad spectrum of dental topics. The mission of "Dear Doctor" is to provide a reference library of information about the latest developments and advancements of all aspects of dentistry to help patients make the best oral health decisions. Here are some print advertisements for Snow Dental Care that you may have seen in Diablo magazine.